Ah yes, the most commonly made dinner in my house. 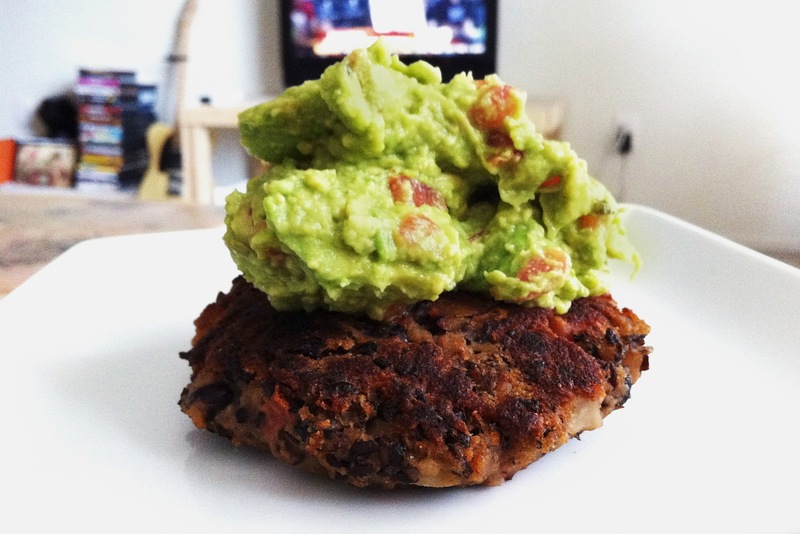 The black bean burger. Specifically, the Mexican black bean burger. You cannot go wrong with these! So simple and quick to make, and exploding with flavor. Drain and rinse black beans in a colander, then place in a mixing bowl. Toss beans with flour and spices. Then, with your hands (yay for getting messy! ), squish and mash the beans up until about half are fully mashed, leaving some whole for texture. Add in the pico de gallo (or other salsa) and incorporate it into the bean mixture with your hands. If the mixture is too wet to form patties with, sprinkle in more whole wheat flour until desired consistency is reached. Heat a tablespoon of olive oil in a frying pan on medium heat. Cook patties in the pan for about 5 minutes on each side, or until they are nice and brown and crispy. Dress up the burger however you'd like - the most common way in my house is just topping it with some homemade guacamole (2 avocados + sea salt + pico de gallo). I'm getting hungry just writing this post. This was excellent!!!! I tracked it on Weight Watchers Point Plus (minus guacomole & only 13.3 oz of beans- used what I had) & it came out to 5 points a serving. Yay! I'm so glad you like it =) and thanks for sharing the points info! Of course! Hope you enjoy it!